The Stakeholder's Chartbook: Stocks Up 12% on the Year; Does It Really Matter? Stocks Up 12% on the Year; Does It Really Matter? The title of this posting is not meant to be cynical. Well, yes it is. Cynical but hopefully enlightening. Third quarter earnings season has recently come to an end and during such periods analysts devote considerable attention to recent corporate performance and more importantly use their findings as a basis to divine the outlook for future quarters. The value investors place on equities historically has borne relevance to the broader economy as healthy economic growth has been translated into a robust stock market. And as stock prices are forward looking by nature, rising shares should be a harbinger for sunny days ahead, hence why the S&P 500 is included in the Conference Board’s index of leading economic indicators. But there is reason to believe that this historical relationship has broken down of late. One possible culprit is the Fed’s overt goal of inflating asset prices in hopes of having investors acting out those ostentatious December to Remember car commercials; the so-called wealth effect. Another cause for caution is that, scarred by the recession, fewer investors are participating in the market’s ascent. Combine these two and we have the possibility that the worn-out cliché of Wall Street vs. Main Street may adequately capture present conditions in the country. Those still in the market are benefiting from the Fed’s largesse while for everyone else it still feels like mid-2009. This migraine is a consequence of another goal of the Fed’s attempt to pump up of share prices…enticing corporations to ramp up capital expenditure and hire workers who then rush out and spend spend spend, thus creating a virtuous circle…has fallen flat on its face. Furthermore, any increase in shares based on sound fundamentals may be a result of U.S. corporations’ foreign earnings (roughly 46% of sales) rather than reflecting strong prospects at home. In this case, equities investors may indeed feel wealthy enough to spring for that luxury car (complete with big red bow on the hood……I hope no one has ever done that), but the 7.9% (14.6% using a broader measure) of Americans out of work and shelling out north of three bucks for a gallon of gasoline won’t likely practice such magnanimity over the holiday season. Not to completely plagiarize the posting that followed the Q2 earnings season, but the narrative has changed little. At that time, year-on-year growth in quarterly profits had slowed to a snail’s pace compared to the periods immediately succeeding the recession. With nearly all S&P 500 members reporting, the rate for Q3 has turned negative, compared to the same period in 2011 ($24.30 vs. $25.39, or a 3.6% decline). 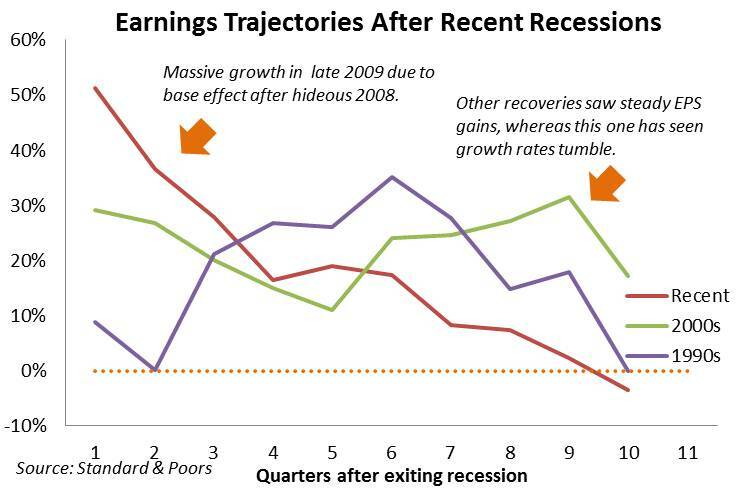 Perhaps more alarming is the consistent downward revision of future earnings forecasts. Over the past year, EPS forecasts for the current quarter (Oct-Dec) have been dialed back 14% to $25.68. Since March, full-year 2013 earnings forecasts have dipped nearly 4% to $113.38. Should….important word…that target be hit, it would represent a 14% increase over full-year 2012 estimates, which far outstrips the paltry 3% growth expected between this year and last. Hope springs eternal. Optimist will point out that over 63% of firms have beaten analysts’ quarterly earnings estimates. But when gauging this metric, one again has to exercise a bit of caution…..oh hell, cynicism. There are some extremely sharp analysts who brew up these estimates. That said, these numbers are the product of a process akin to something of a parlor game. Divisional and regional finance VPs, practicing the tried and true managerial technique of underpromising and overdelivering, feed the CFO lowball forecasts with the hope of being rewarded once the quarterly numbers are exceeded. For his part, the CFO pushes back, but at the same time engages in the same method when presenting guidance to Wall Street. If the analysts bite, they dial back their estimates, and once earnings beat the diminished forecasts, shares (theoretically) rally on the confidence that the firm has a rock-star management team. So in this platform, we shall ignore the percentage of firms that either beat or missed consensus. Higher Sales to the Rescue of Lean-Running Firms? 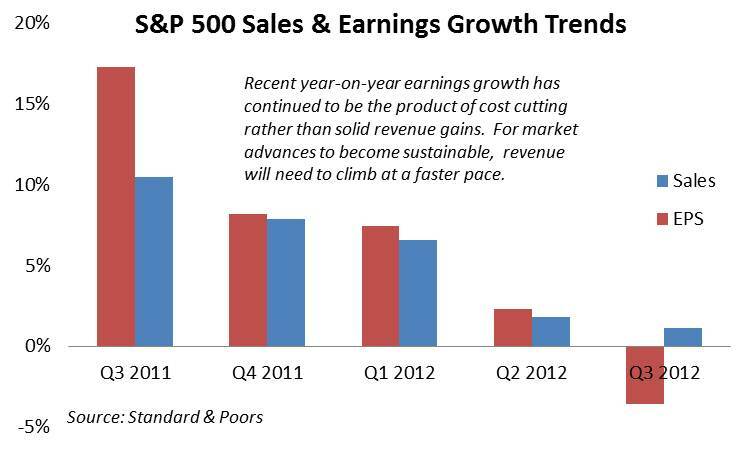 For much of the post-recessionary period, earnings gains have far outpaced top-line sales figures. While it is laudable for management to constantly streamline operations in order to cut expenses, too much of a good thing means firms will be ill-equipped to handle an increase in business, should that day ever come. If they are cutting because they foresee little possibility of increasing operations in the near term, well then, that’s a whole other cup of tea….a very bitter one. And if trimming expenses takes place solely to drive EPS gains and satisfy Wall Street, that game has a short life. Investors are well aware of the paramount need for firms to increase revenues at a solid pace. As seen in the chart below, sales growth has tapered off over the past five quarters to critically low levels (under 2% for the past two periods). Proving our point that expenses can only be cut so much, YoY earnings gains have shrunk from over 17% to this quarter’s negative reading. In order to hit next year’s earnings targets, firms will need to increase top-line growth; a challenging task in a consumer-driven economy suffering from chronically high joblessness. With earnings forecasts consistently being revised down and Q3 revenue and EPS lousy, what has driven the near 10% rally in equities since early June? Here we refer once again to the Three “E”s of equities; earnings, economics and emotions. We covered earnings. Paltry. The economic outlook, especially when accounting for some form of higher taxation in 2013, will likely remain subdued. So that leaves emotion. 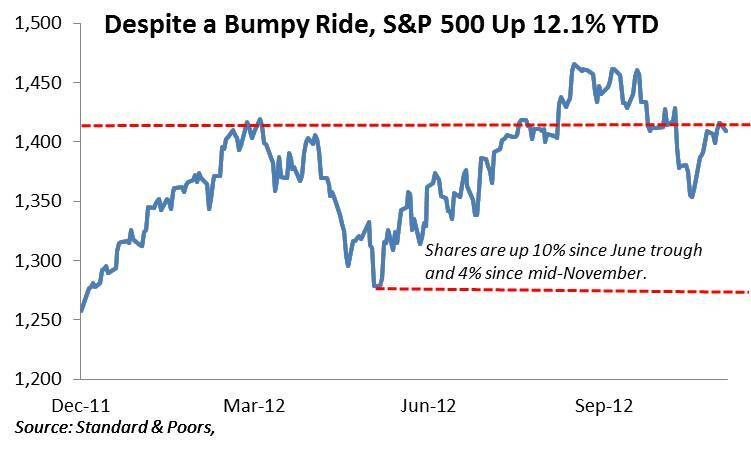 Perhaps investors simply view stocks as sufficiently cheap and have jumped back into the market. In June, the forward P/E was around 12.5. The current figure based on the next for quarters of earnings has inched up to 13, still relatively cheap compared to historical valuations. But shares likely have lagged historical levels for good reasons, such as the aforementioned tepid earnings growth and economic headwinds. When looking at P/E ratios based on GAAP earnings, which take into account extraordinary items, valuations are slightly higher, though still below the long-term average. There is never a deficit of opinions advising the public when to get into stocks and which sectors to favor. While certainly valuable insight (if correct), the more relevant question is when will positive equity performance again be reflective of robust growth prospects for the whole U.S. economy. 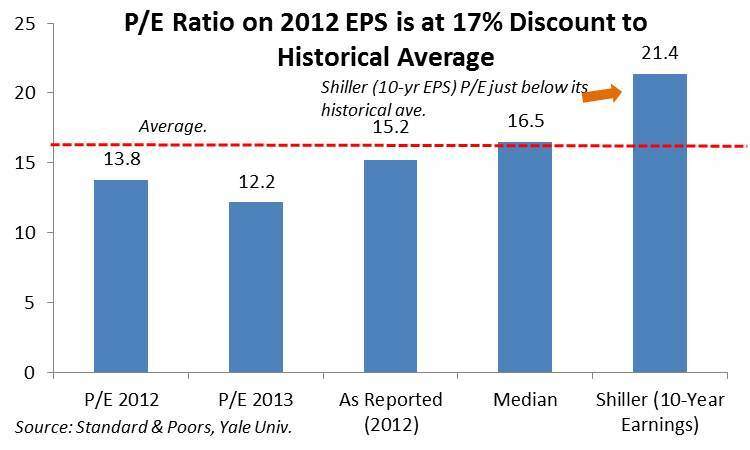 Rising share prices should not only benefit those in the market by fueling the Fed’s magical wealth effect. Instead shares should rally as the worker productivity increases, which ultimately drives wage and earnings growth. In other words: we should all be in this together. From 1990 to 2006, quarterly productivity growth averaged 2.4%. Over the past three years it has averaged 1.1%. The result is stagnant wages and enough slack capacity to enable firms to dial up productivity before having to hire new workers. Once that step finally occurs, the powerful engine of personal consumption will kick in, benefiting sectors reliant upon confident…and employed…consumers. We will know that has happened when gains in domestic, consumer-centric sectors validate broader market advances. This would signify a virtuous circle of capital investment, job creation and consumption, rather than rallies being attributed to a narrower play on globally sensitive S&P 500 members or on Fed actions meant to drive (i.e. distort) investor behavior. Investors in U.S. equities are fortunate that such a large percentage of sales is generated abroad. But this has dipped over the past three years as Europe fights its crisis and emerging market buyers of American-made capital goods face their own economic slowdown. Domestically, while there have been no outlines of a potential deal to avert the fiscal cliff, one can expect certain taxes, like those on dividends and capital gains to revert to higher levels. Short-term, such an outcome may be partly responsible for the post-election rally as investors take advantage of current tax policy. Long-term, higher rates would likely serve as a disincentive to invest in equities. Such tax policy would be yet another distorting force on investor behavior. As with any distortion, it would further clutter the efficacy of financial markets in executing its historical role of allocating capital to its most productive use. The result: the prospects of Wall Street and Main Street would continue to diverge, undermining what has historically been a mutually beneficial relationship.